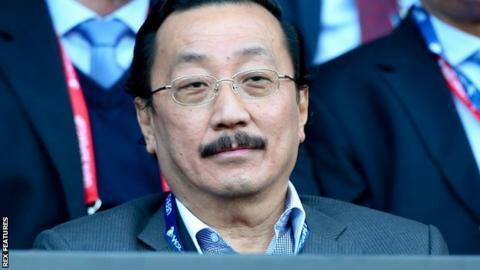 Cardiff City owner Vincent Tan says he is ready to halve the club's debt of approximately £140m and insists the club will be debt-free by 2021. Tan plans to convert £68m he is owed by the Championship club into equity while writing off another £10m. He said he wrote off £13m in 2015, turned £3m into equity and settled a £5m debt with creditor Langston, owned by former Cardiff owner Sam Hammam. The Malaysian entrepreneur says he will "resolve over time" the remaining £40m. "Because we have recently reached agreement with one of the club's long-standing creditors, we are in a better position to convert our loans into equity," Tan said. Cardiff's debt was £174m at the end of the 2013/14 financial year after their season in the Premier League - most of it owed to major shareholder Tan. The Welsh club originally had a £24m debt to Hammam, who is currently their honorary president, and now Cardiff must settle their £5m arrears with him by 2 March after agreeing an out-of-court settlement. Tan outlined his financial proposals at a question-and-answer session with supporters at the Cardiff City Stadium, where the owner also revealed Cardiff had rejected a £6m bid for Scottish goalkeeper David Marshall. Cardiff are ninth in the Championship, five points outside the play-offs, and Tan insists manager Russell Slade has his backing despite supporter unrest over the Bluebirds' style of play. "I think the fans should support Russell - he has done his best," said Tan. "I want the fans to be more reasonable with him. They should support Russell Slade. He has done a great job in the current situation. He has inherited a squad of 50 players. Some of them had no discipline and he managed to clean it all up. Tan also revealed he had been to Cardiff's training ground to give the players a "pep talk" and told supporters: "I am convinced that with this current group we can get promoted."